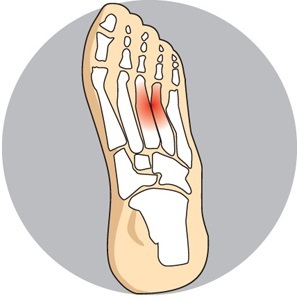 Morton’s Neuroma is a common foot problem associated with pain, swelling and/or an inflammation of a nerve, usually at the ball-of-the-foot between the 3rd and 4th toes. The first step in treating Morton’s Neuroma is to select proper footwear. Footwear with a high and wide toe box (toe area) is ideal for treating and relieving the pain. The next step in treatment is to use an orthotic designed with a metatarsal pad. This pad is located behind the ball-of-the-foot to unload pressure, and relieve the pain caused by the neuroma. Foot Solutions are able to customise an orthotic to suit your condition.